Gosh, my holiday seems like a distant memory now and I've been meaning to get this post up for a while actually but, you know, life gets in the way sometimes! So I will begrudgingly admit that the reason for my initial 'sparked interest' in Mykonos as a potential holiday destination was.... (hangs head in shame!...) the Kardashians, who went on one of their legendary 'Family Vacay's' to the island a few years ago! I just remember how beautiful it looked and then after further (and in-depth!) research, fell in love with this pretty little island. I had toyed between this and Santorini to be honest, but after much consideration decided to go with Mykonos. Now, I hadn't realised initially that it has a reputation as a bit of a 'Party Island', apparently rivalling the likes of Ibiza?! Having been there I have to say that I don't really know why it has this reputation because it is one of the most beautiful and serene places I've ever been, with plenty of quiet and secret spots to explore. Sure, the town centre can get a little lively in the evening but nothing more than a bit of 'hustle and bustle' and you're certainly not going to get caught in the middle of a club with five thousand other people listening to house music with a bunch of drunks. Oh no, Mykonos does night life with class and sophistication. We're talking gorgeous, plush cafe-bars, cocktails, glasses of wine and bubbles either by a beach or in the pretty and quaint Mykonos town. I travelled with British Airways from Heathrow. This is a new destination for them for 2016 and many other airlines are following suit, so I would imagine you would be able to get a good deal if you shop around. I'd really recommend hiring a car and pick it up from the airport on arrival. The island is so small that you can literally drive around the whole thing in a few hours and because there are so many gorgeous places to explore it's such a fantastic way of seeing more while you're there. 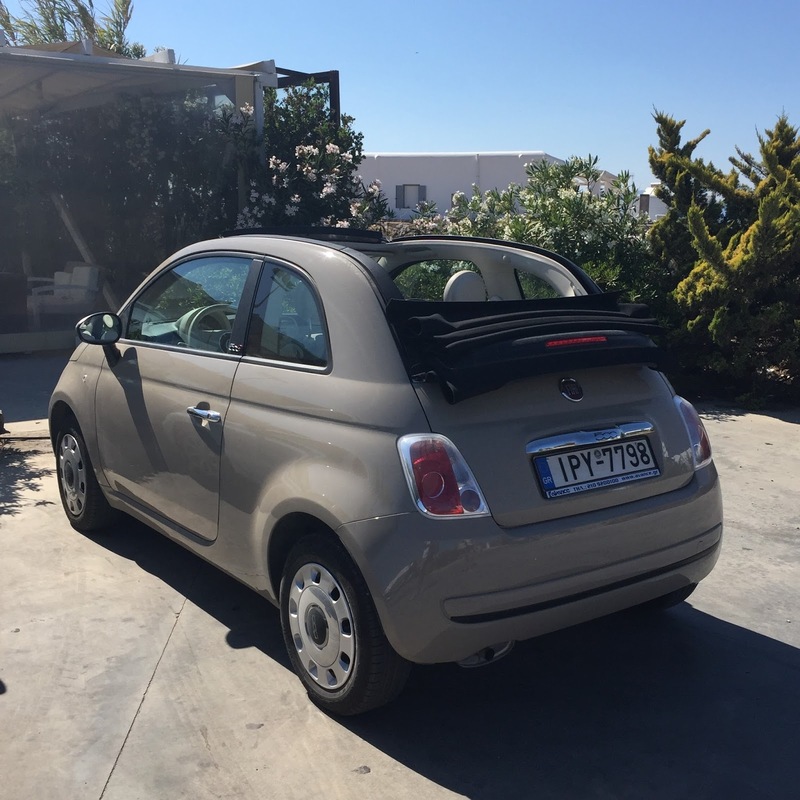 If you've been following my blog for a while you'll remember the white Fiat we had last year in the South of France, this year we went for a similar model but without the roof! So so so much choice on offer to suit all kinds of budgets! You can go super super expensive, mid range or it is possible to stay at Mykonos on a budget too. Something for everyone. I stayed at The Colours of Mykonos - Luxury Residences and Suites and had a great experience throughout. On arrival we were made to feel very welcome by Vicky who greeted us with drinks and gave us some excellent recommendations for things to do and some of her favourite restaurants. It's a small, boutique hotel set out a bit from the main towns in a peaceful area with an absolutely stunning view. The room was perfect and decorated in a very 'Instagram-worthy' style! (each room is different) It was very clean, maintained, well equipped and comfortable. We had two televisions (two! ), a Nespresso machine, a fridge and the toiletries were Hermes, need I say more! Oh and I forgot to mention the hot tub on the balcony! A continental breakfast is delivered to your balcony in the morning in a picnic basket and you can choose exactly what you'd like. I thought this was such a great idea! There was a small pool area with loungers, beds and bean bags to relax on and we tended to sit here in the morning after breakfast before heading out in the afternoon. And let's just say, Greek food did not disappoint! A quick run down of some must go-to restaurants if you're planning a trip to Mykonos. Ali Tou Thodori - Contemporary and Traditional Greek Cuisine. Gorgeous setting in the Platis Gialos beach area. Kalita - Mediterranean / Greek food with a twist. We stumbled on this little place by accident whilst walking around Mykonos town in the afternoon then went in the evening. Stunning setting in a candle-lit courtyard. The food was absolutely fantastic. Set in the heart of Mykonos Town. Pasaji - Greek / Asian Fusion - Another place we came across by accident whilst trying to find our hotel on the way there! This absolutely stunning beach bar / restaurant / shisha lounge is situated on Ornos beach. It was such a perfect spot we went here twice during our holiday. Once for sun-downers and then on the last night for drinks, food followed by shisha. I think this was my favourite restaurant. A must! JackieO' Beach - Traditional Greek Cuisine - A afternoon drive around the island in hunt of Super Paradise Beach and we found JackieO' Beach. What a place!!! It's a beach club set in the side of the coast with sensational views. I ordered their take on a Greek Salad and I wasn't disappointed. Oh and they have Whispering Angel Rose Wine on the menu - I mean come on, could this place get any more perfect?! The restaurant is set at the top of the venue overlooking the beach, pool and bar. They even have valet parking!! Nice n Easy - Organic Menu. This was hugely recommend so we decided to give it a go. Fantastic wholesome food but be warned, portion sizes are ma-hoosive!!! It's based in Mykonos Town and had a nice vibe to it. Pepper - Cheap and Cheerful great quality Greek 'Fast Food' although to be honest, it was more like a little restaurant. I had a burger here but they also do traditional Greek style food too. Chips with Feta Cheese....yum! Really recommend this place, it's in a corner of Mykonos town hidden away amongst the shops. Very popular and I can see why! Bonbonniere - Also a club, but has a fantastic outdoor terrace at the front (opposite Louis Vuitton!) I had a cocktail here in the afternoon after a bit of shopping. I wasn't aware of this but there is also a Bonbonniere in London. Nammos - This is an absolute must if you go to Mykonos. Janine Eleini (go and check her Instagram account out HERE!) actually recommended it to me on Instagram and I can see why! Girl has great taste!! Such a fantastic beach club and definitely the 'place to be'! Everyone is beautiful, the bar and restaurant are impeccable and everything is just so pretty and perfect. Service is also top-notch. I'd go back here for sure. Make sure you take a large memory card for your camera is all I can say! Once you're in the centre of Mykonos Town it's all pedestrianised and is made up of many many little alley ways, it almost feels like a big maze and each turn you take you find something new! People actually live on some of these streets but it's also made up of little shops, cafes, bars, restaurants and churches. It's the most quaint, perfect, little place I've ever had the pleasure of visiting. And this is where I bombard you with the pictures that didn't make Instagram! Finally I thought it would be useful to give you some indication of what sort of things to take and wear if you're here. The whole 'vibe' is very cool and chic so lots of make up, heels and 'glam' is a big NO NO! You're going to want nice bronzy minimal make up (a coral lipstick is a must!) and some shimmer to pop on your legs and arms in the evening for that sun kissed look. Pack plenty of bikinis and loose fitting clothing - think dresses, floaty tops, cut off denims and flat sandals. You'll be walking around quite a bit so heels are a definite waste of time. I didn't take any! Effortlessly chic is the look you're going for :) go check out my Instagram (@elisabethrilatt) if you'd like some ideas, I posted quite a few outfits on their whilst on holiday! Congratulations if you've made it this far! I appreciate this has been a long rambly post, but if you're thinking of going to Mykonos I'm hoping it will be useful!